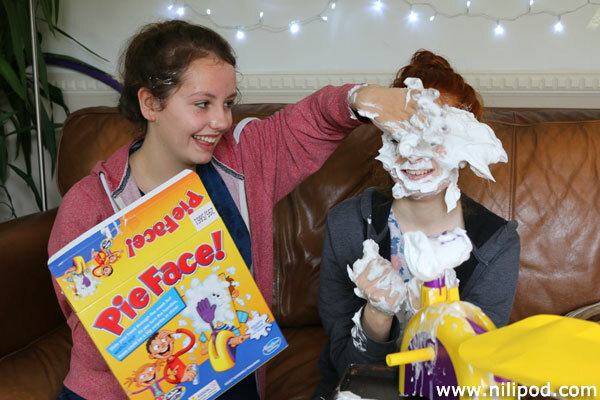 Playing Pie Face was epic and seriously good fun, although it was a little bit messy to say the least. It is made by Hasbro Gaming and is ridiculously popular at the moment, being sold out in many shops, with the price seeming to go up and up on Amazon. We managed to get ours from Argos for the RRP of £19.99, which is really plenty of money, because after all, it is just a bit of plastic at the end of the day. Pie Face is quite easy to put together, with the yellow handles fitting in the side, the purple chin rest at the front and the purple hand at the other side, although we were initially confused by the shape of the hand, because it does look like it should go the other way up. Anyway, we used spray cream to start with, which worked really well. We soon lost count of the scores - it's supposed to be the first one to reach 25 points by spinning the spinny spinner thing.